This product contains 1. )Yantra Tortoise, 2. )Laxmi Charan Paduka, 3. 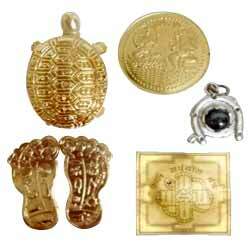 ).Laxmi & Ganesh Coin 4. )Shani Hanuman Raksha kavach Pendent ,5.) Kuber Yantra.Dhan Laxmi Yantra brings wealth to the worshiper. Placing Dhan Laxmi Yantra at home or office in festivals bestows one with divine happiness,mental and spiritual satisfaction, success and a lifetime of luxuries.